En analog lip sync korrigerare. En enkel reglering med upp till 300ms delay. Du låter helt enkelt det analoga ljudet passera igenom produkten, och sedan kan du med reglaget välja att sakta ner hastigheten på ljudet så att det synkar bättre med exempelvis bilden. 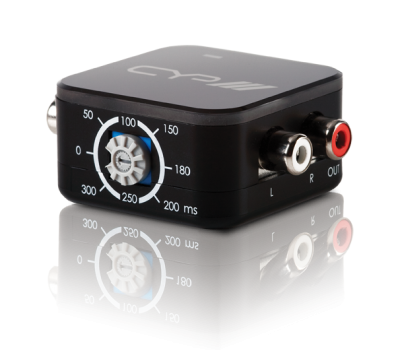 This analogue stereo Lip Sync Corrector is a small device for delaying audio signal to overcome audio sync issues. The AU-D18 Lip Sync corrector is able to adjust the timing to the display/amplifier so that users may received both video and audio in sync. No more annoying sound mismatch. The Lip SyncCorrector is ease use with a simple setup and an affordable unit for sound delaying. Lip Sync corrector with adjustable delay between 0 & 300ms. Analog to analog signal bypass. Dimensions45(D) x 45(W) x 25(H)mm.